Glass beads have been a favorite at my preschool and with my own children this past year, and we could not get enough of them. I knew they would be the perfect item for my new alphabet. They have a beautiful sheen to them, and the smooth texture makes them extra enticing for feeling and rubbing. We normally use these in block area or science. These ones are the jumbo ones that are easily found at dollar stores or craft stores. To transform these beauties into an alphabet, I grabbed my new favorite writing utensil: glitter glue! It has the perfect texture for children to feel, and the glitter is an added bonus. I took some gold glitter glue that I purchased at the dollar store and just squeezed the letter on each bead. If it gets peeled off, it’s no big deal because I can easily remake them. If they get dropped, it’s not a big deal either. My jumbo glass beads have had their share of being dropped and abused from the normal wear and tear of preschoolers, and they withstand it all pretty well. I think the only concern I would have with these is children who put them in their mouths, so always use close supervision. You will notice that I put the vowels on a blue bead. It’s just to help differentiate consonants and vowels, and it is a Montessori technique that I adopted. So now what? 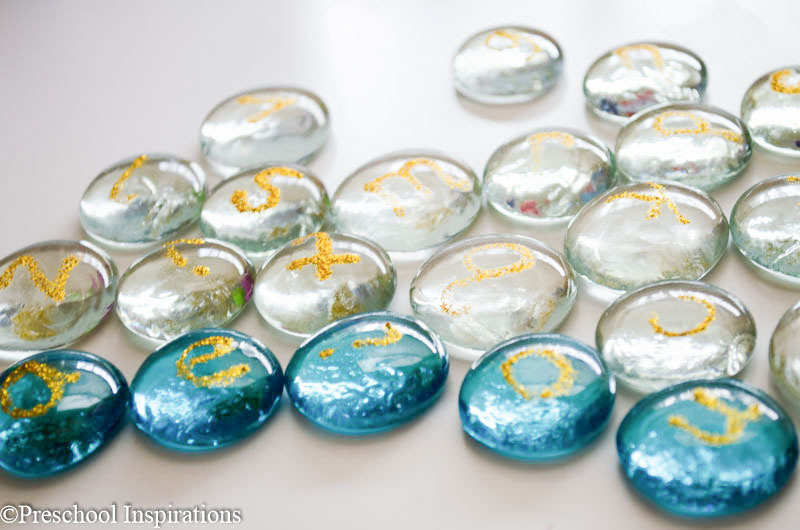 What can we do with a glass bead movable alphabet? 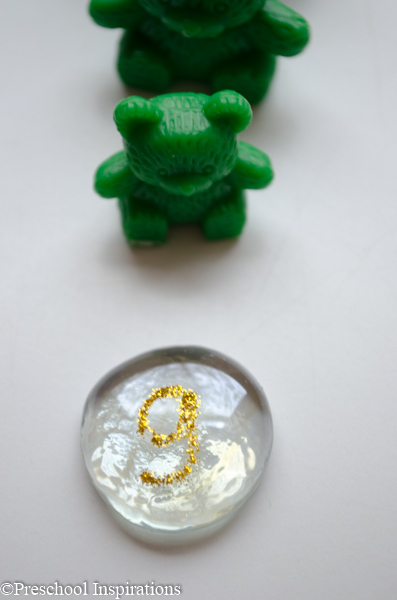 Practice beginning word sounds, such as these green bears. The movable alphabet is a fun way to practice name recognition. I don’t have upper case letters yet, but I do plan on making some! 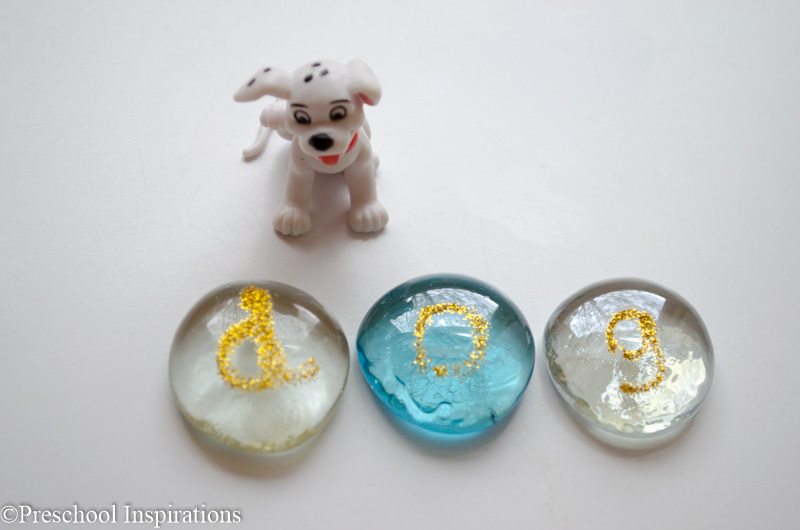 Word building is also another way to use the alphabet glass beads. I love to use items around the classroom that the kiddos adore and use on a regular basis. I made these so that the kiddos could also trace them with their fingers. And of course I love the open-ended ways that these can be used. 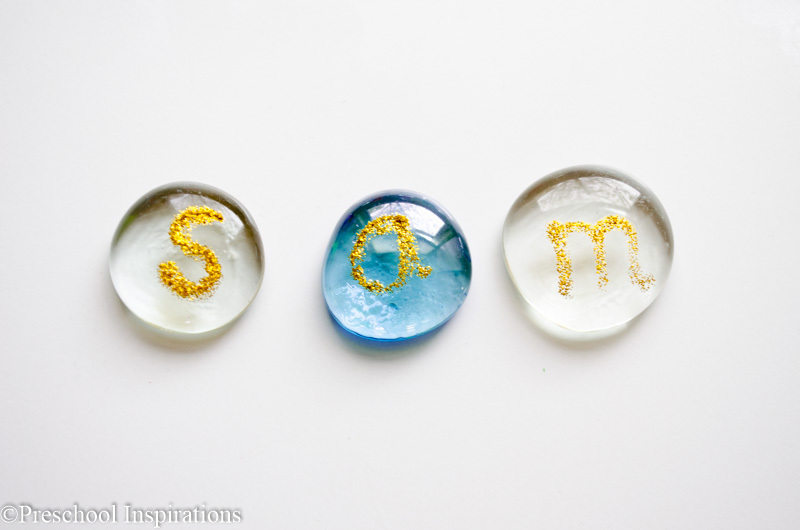 Did you use glitter glue to make the letters, does it stay on the glass pebble. I have seen them with marker on top, I could see my kids picking that off , possibly eating it too. Hi Lisa! The glitter glue does stay on, and it’s actually not super easy to take off. If you think your kids would eat it, I would definitely hold off on this activity until they are older :).